Tuffa have recently supplied multiple adblue storage tanks to the National Health Service. Legislation has been introduced which means that the use of a Urea solution has been a requirement since 2005 for certain types of vehicles, progressing to 2013-2014, where panel vans above 2610kgs have become in scope of these regulations. This will mean a greater demand for Urea solution as fleets replace their older vehicles with new vehicles which require the additive. 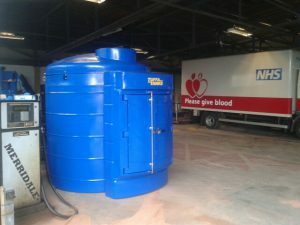 NHSBT required the supply of bulk storage tanks complete with electrically operated dispensing pumps complete with metering devices to various of it’s sites. Tuffa were able to manufacture and supply a variety of our AdBlue Storage tanks ranging from the 1350SLBFS/SkyBlue, 2500HBFS/SkyBlue, 3500VBFS/SkyBlue and 6000VBFS/SkyBlue.